Charles Starrett plays the cowboy hero known as "The Durango Kid," a masked vigilante who fought for justice -- thwarting the evil plans of looters, land-grabbers, claim-jumpers on the range. Along with sidekick Smiley Burnette, he ruled the West. A prospector discovers gold left behind in Texas by Santa Ana and his army. A criminal and his gang kidnap the prospector in the hopes he will lead him to the treasure. The Durango Kid is called in to find the prospector, rescue him from the criminals and bring them and their mysterious leader to justice. The Durango Kid returns to fight a double-crossing villain that is attacking his rival's business. The criminal sends his men to supply the Indians with guns to attack the outposts and wagon caravans owned by his rival. The Durango Kid must stop the gang and expose the mayor's criminal activities. The Durango Kid rides again, this time to try to maintain peace between a post of Calvary officers quartered at Fort Sanders and the local Indians. When Chief Eagle is mysteriously shot during a meeting to discuss peace, his son Running Wolf threatens to avenge the death of his father with war. The local Indian Agent Steve Holden cautions the Colonel to remain calm and show Running Wolf that he stands for peace, but Steve finds himself caught in the middle with neither side trusting his council. A greedy family looks to control all the land in the valley in order to gain the water rights from an underground river. After a rancher is killed by the gang, the Durango Kid arrives undercover to help the rancher's daughter and young son. Our hero looks to bring those responsible for the killing to justice and to save the ranch. The Durango Kid, his sidekick Smiley and the local sheriff visit a ghost town in search of some stolen gold. The criminal responsible for the theft and hid it many years ago is now blind, in jail and refuses to reveal the whereabouts of the gold. Our hero has his work cut out for him if he's going to locate the hidden gold. A proposed dam building has two ranchers at odds with each other to the disappointment of their children, who love each other. When the banker who was going to lend the one rancher the money to build the dam is killed, the sheriff is forced to arrest his own father, the prime suspect. The Durango Kid arrives to uncover the truth behind who is causing the problems between the ranchers. A plan to exploit the trouble between settlers and Native Americans has a criminal gang masquerading as Indians and raiding the settlements. The gang's boss then sells rifles to each side and he reaps in the profits. Only the arrival of The Durango Kid will help stop the criminals and bring peace to the land. The Durango Kid is out to bring in some wanted criminals who were responsible for holding up a bank for $30,000. The trail leads him to Bonanza Town where he runs into some trouble with a corrupt town boss and a presumably-dead outlaw still very much alive. Our hero must rally the town against the criminals and bring order and justice back to Bonanza Town. An outlaw gang is terrorizing a town and its leader is captured and jailed. In order to locate their stolen loot and to round up the entire gang, the Durango Kid has himself imprisoned with the gang leader. Breaking the two of them out of jail, the Durango Kid hopes to infiltrate the gang from the inside and solve the case. 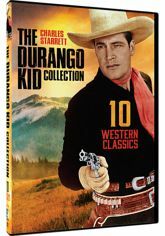 In this final appearance of Charles Starrett as The Durango Kid, our hero must help prove the innocence of a wrongly convicted man. A former boxer returns to his home in New Mexico and is framed for a murder. The Durango Kid must free the innocent man and then track down who was truly responsible for the murder he was convicted of.